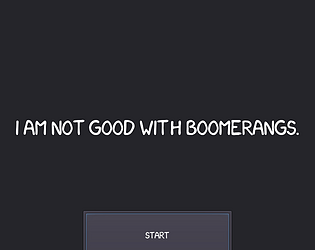 When throwing boomerangs becomes unrealistically dangerous to yourself. Ranked from 6 ratings. Score is adjusted from raw score by the median number of ratings per game in the jam. Please list any pre-made art/music/other assets that you used. Anything else you want players to know before they play? The game is still in development. So no sharks yet. I will keep updating it. I had no idea what I was supposed to do. But, I had a simple please on killing myself with rocks. Ironically, the rocks behave more like boomerangs than the actual boomerangs do. My XKCD game jam analysis is out! If you want to see more content like it subscribers are what keeps the channel going so share if you want to help out! Ha ha, yeah fixed the rocks and other stuff, and added a few things too. Like a pause menu that tells you the objective again.